If you love beer, your next vacation should be to a hotel in the middle of nowhere. In Ohio. Sure, there are incredible beer cities all over the country, but you should visit Canal Winchester, Ohio immediately. Why the hell would you want to take a beer vacation to a hotel in a small town 20 minutes outside of Columbus? 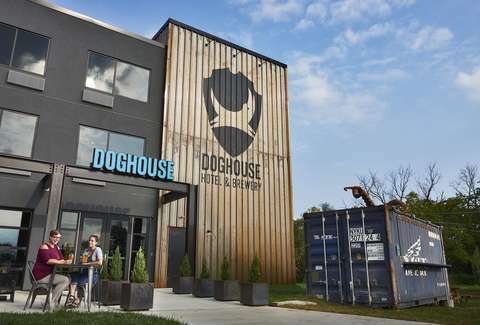 You wouldn’t typically, but a couple of months ago the UK beer legends/brewpub operators at BrewDog opened up the 32-room DogHouse Columbus hotel. 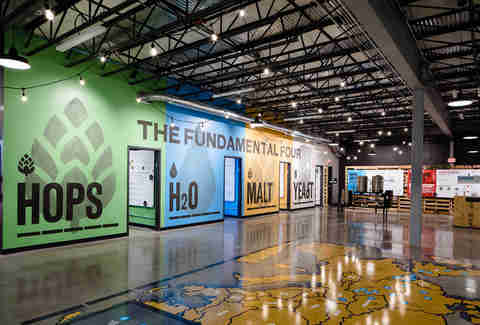 It’s one component of a 42-acre complex that includes a massive beer production facility, a brewpub, and a beer museum. And it's insane. It was also one of the more immersive, unique, beer-filled nights I’ve ever had, and I’d wholeheartedly recommend it. So how do you maximize this experience, when you'd probably just be content to sit in the room drinking a great beer? I picked up a couple tips while I was staying there, and before you book your next flight to Columbus and grab a room for a night or two, this is what you need to know. Protip: they’re mostly booked on weekends through April, but going to the DogHouse is worth a few vacation days for a mid-week stay. Splurge a little and get the Brewmaster suite for ~$300, which overlooks a sea of barrels and foeders aging the brewery’s sour beers. When you walk into the suite, a garage door opens to the production floor, and if you’re there between around 10am-5pm, you can watch the barrel wizards cast their spells onto the booze. The suites don’t get natural light, but once you draw the shades, the spacious rooms with couches and multiple TVs are bathed in a moody faux-neon light. It’s perfect for drinking the plethora of beers in the mini bar. 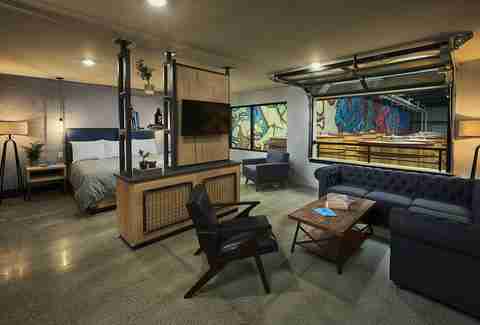 Whether you stay in a suite or not, you’ll have access to the same beer-based amenities. 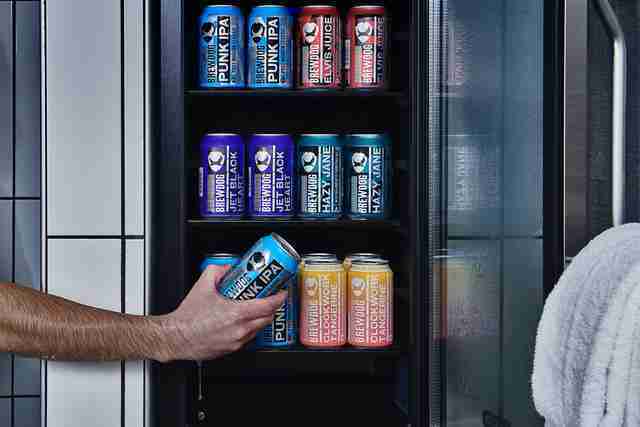 Everyone gets a free BrewDog beer upon check-in, a growler fridge you can fill up in the lobby (or on-site brewpub) that’ll keep your beer fresh during your stay, and a mini bar filled with cans and bottles from some of the owner’s favorite breweries worldwide. Many of these cans aren’t the easiest to source -- my room had selections like AleSmith Speedway Stout and Evil Twin Nomader Weiss. Don’t miss what they’re pouring from the lobby bar, either. The beers there rotate quite a bit, but cans of the hard-to-find Toppling Goliath Pseudo Sue and Crooked Stave Wild Sage were available when I visited. 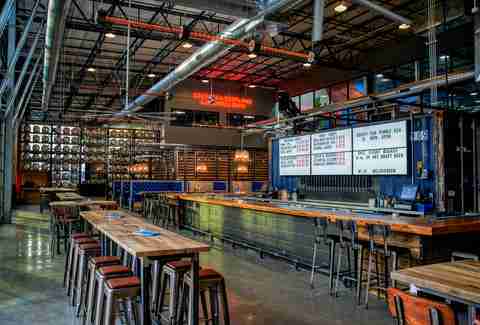 All BrewDog cans will run you only $4, while drafts are only a few bucks more, and even the beers from other breweries are reasonably priced. Once you get the beer you want, the lobby offers plenty of nooks and crannies to have a beer and hang out or play a board game. When the weather’s nice, the outdoor areas provide picnic tables, a bar inside a shipping container, live music, and a dog park to let your best friend run free. If you enjoy taking hot showers and drinking cold beer, congrats, you’re human! And you surely understand the appeal of a shower beer. The DogHouse has outfitted the rooms with the perfect elements for an optimal shower beer experience: a beer fridge in the bathroom; a spacious shower with enormous rainforest shower heads that make you feel like you’re standing under a waterfall; a shelf to put your beer on when you soap up; and shampoo, body wash, and conditioner made by a local soap company that uses BrewDog’s Elvis Juice, a delicious 6.5% ABV grapefruit IPA. Getting clean with grapefruit soaps and shampoos while drinking a grapefruit beer is almost more luxury than anyone deserves in a lifetime. And you know what helps too? The beer is damn good! Nothing about this hotel is half-assed, and that includes the museum. It’ll help any newbies you’re staying with learn more about how beer is brewed (the hops room being my favorite, what with the ability to see and smell the different hop varietals). 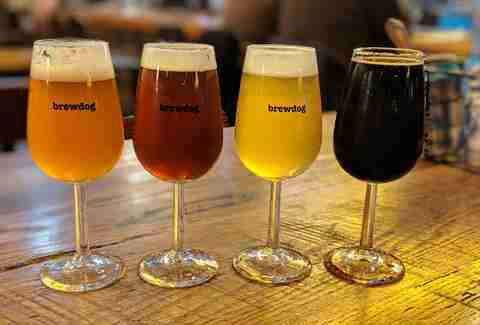 You’ll also get more info about the BrewDog brand, from its humble beginnings in the UK to its current 1,000+ employees and 40+ bars worldwide, including three in Ohio and many, many more to come. If you’d like a guided tour, there’s one with a beer tasting on the weekends for just $20. Drinking beer is always more fun when you’re playing a game, and BrewDog delivers. There’s multiple pinball machines (Guardians of the Galaxy and Walking Dead among them), two shuffleboard tables, and big Connect 4 in the pub, while the hotel lobby houses multiple boards games and a seriously nice ping pong table. Oh, and my suite had a Yahtzee board in it! Yahtzee, indeed. The brewpub has been open since 2017, and has become a spot for locals and tourists alike. The night I had dinner there, Trivia Night was in full swing. Every employee of the pub is a Certified Beer Server, so they’re great at finding beers to pair with your meal. They’re plating everything from fish tacos to smoked brisket and 12” cheese curd and bacon pizzas. I ordered a flight of beers (including selections from other Ohio breweries MadTree and Rhinegeist) and paired it with a delicious butternut squash hummus and an even better sweet potato burger. And you need to get something barrel-aged, especially if your suite overlooks the barrels! I needed time to sip on the decadent Barrel Aged Sweet Stout I paired with a chocolate cake, so they let me take the beer to the room. You’re welcome to drink anywhere on the grounds that’s not the parking lot, which is another nice perk to staying there. One of the more unexpected benefits to staying in the hotel was being able to talk about beer with people who love it as much as you do. There isn’t a check-in desk at the lobby: the bartender checks you in behind the long bar near the entrance, and then immediately offers up a complimentary BrewDog beer. 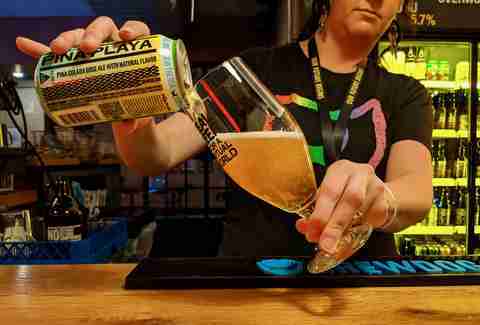 I selected the Pina Playa, a pina colada gose that’s so tropical you’ll temporarily forget that it ever rains and snows in Ohio. When I expressed surprise that they were able to secure cans of Pseudo Sue, a bartender pointed out other great beers I might be interested in. No matter who you speak to in the hotel or the pub, they’re probably as into beer as you are (if not ore). Ultimately, the people, food, accommodations, and the quality of the beer make this a special destination. After all, it’s one of the few places on Earth you can literally eat, sleep, and breathe beer. You’re probably flying out of Columbus’ John Glenn International, so before you go, explore the thriving brewery scene that’s truly out of this world. We’re not above astronaut jokes here. 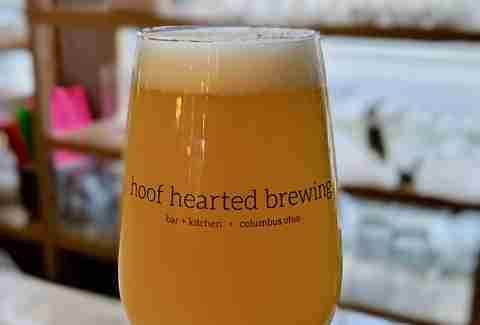 Hit up Hoof Hearted Brewing for unique, limited-release beers like the sour berry blast DIPA Quit Yr Fussin On At Me! ; Rockmill Tavern for elevated pub food and solid Belgian-style brews; Land-Grant for BBQ from the Ray Ray’s Hog Pit food truck and sessionable beers like the Urban Sombrero Mexican lager; Antiques on High for barrel-aged sours in a brand-new retro taproom from the people behind Seventh Son; and Wolf’s Ridge Brewing for food that everyone in town raves about, and beers that measure up to the high quality of the food.